PanelMate Power Pro 1785T and 1785K are still available. The good news is that we can Upgrade all Brands and Models of PanelMate Operator Interface Equipment and we can provide new Operator Interface systems that are drop in replacements! The Eaton Operator Interface Business Unit was founded in 1976. Quickly becoming one of the leaders in its industry, Eaton now has an installed base of over 280,000 units. 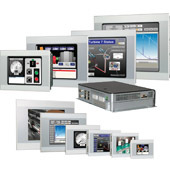 Its PanelMate family is the most successful line of Operator Interface Systems ever produced. Today, in its seventh generation, it is by far the best Operator Interface Solution available from any source. Now Eaton is introducing a low cost family of easy to use and integrate operator interface systems, the new HMi family of Operator Interface systems. The PanelMate Power Pro family is the best selling equipment that the Eaton Operator Interface group manufactures and it is a direct replacement/upgrade for any of the earlier models and brands of PanelMate equipment. Coupled with the PanelMate ePro PS family of Operator Interface systems, Eaton systems provide the best mid to high end solutions in the marketplace. Eatons XV and XP Series of operator interfaces offer high performance platforms that provide unmatched flexibility. Features slim OEM design and a variety of communication port options that include onboard Ethernet on all models. With screen sizes ranging from 3.5 to 15 inches, vast communications capabilities, and a single development software package, the XV and XP Series represent a complete solution to any Operator Interface application. The latest Operator Interface systems from Eaton, the HMi systems provide a low cost yet highly functional solution for the low end segment of the market that PanelMate systems weren't designed to meet. They range in screen size and color to fit available space and application needs. All units offer RS-232, RS-485 and RS-422 communications.